Dhaka, 18 Mar, Abnews: Superstitions are a real fear for some people. Common superstitions (and their origins) might not be based in reality, but when people believe in something so powerfully it doesn't seem to matter. While some of these superstition origins come from religious thoughts, some come from a practical place. You've probably knocked on wood to avoid jinxing yourself at some point in your life without knowing why. This widely-known superstition is a modern take from medieval times, where European churchgoers would touch wood the churches claimed was from the cross, according to Yahoo. Touching the wood supposedly gave a connection to divinity and thus good luck. Has someone ever complimented something you own only for it to later to be broken or ruined? Some superstitious folk might say that was the evil eye at work. To guard against such disastrous gazes, people in Turkey have an amulet called the "nazar boncuğu." The charms are typically blue and white (blue is thought to be a ward of the evil eye as well), and resemble an eye themselves. These charms are common sights in Greece, Egypt, Iran, Morocco and Afghanistan, among other countries. Black cats have always had a bad rap, especially around Halloween, given their perceived allegiance to witches. The poor critters are just as avoided any day of the year, and it's common superstition that a black cat crossing your path is bad luck. But they're not alone. In South Korea, crows are seen as bad luck and possibly even harbingers or death. Ravens too, especially in the U.K., could foretell doom. There's an old British superstition that says six ravens must remain at the Tower of London at all times or the crown will fall. And in Ireland and Scotland, seeing a single magpie is supposed bad luck, but two or more is fine. Apparently it's bad luck to trim your finger or toenails after dark, at least according to superstitions in Turkey, India and South Korea. One Japanese superstition even claims you could have a premature death. Historically, knives or other sharp cutting tools would be used to trim long nails. Darkness plus sharp objects and a then-lack of medical access could have equaled deadly infections. In Spain and Spanish speaking countries, it's Tuesday the 13th that gets people wound up. Martes, Tuesday in Spanish, comes from the Roman god of war, Mars, forever tying the day to violence, death and bloodshed. In conjunction, Constantinople supposedly fell on a Tuesday during the Fourth Crusade. And then Ottoman Turks supposedly claimed the the city on a Tuesday more than 200 years later. OK, so not just whistling in general, but specifically whistling indoors and at the sun are both ill-advised actions according to Russian and Norwegian superstitions, respectively. Whistling indoors supposedly leads to financial problems in Russia. In Norway, whistling at the sun supposedly causes rain. According to Hungarian and Russian superstitions, and surely others as well, sitting at the corner of the table is bad luck. The unlucky diner will allegedly never get married. Some say the bad luck only hangs around for seven years, but as with most superstitions, why chance it? Potential dirtiness aside, superstitions in some Central and South American countries as well as the Philippines say resting your purse or wallet on the ground will lead to bad financial luck. In other on-the-ground-bad-luck superstitions, sitting directly on the cold ground can lead to a woman never having children, according to Russian myth. Want to wish death upon someone, toast to them with water, at least that's according to German superstition. This tale is derived from Greek myth where the spirits of the dead would drink the water from the river Lethe. Lethe, the goddess and river of forgetfulness, would cause the spirit to forget its earthly past before it passed on into the underworld. 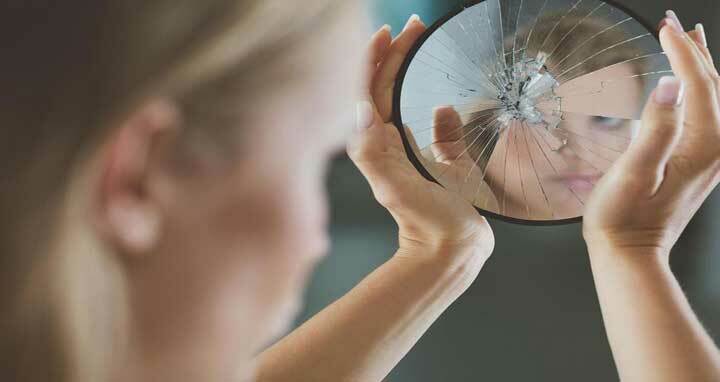 Another widely-known superstition is that breaking a mirror will result in seven years of bad luck. In some folklore, a person's reflection in a mirror was thought to house or be connected to a piece of the person's soul. With that in mind, breaking a mirror, especially if it has your reflection in it at the time, doesn't sound too great. As a soul-stealing aside: Some lore claims photographs capture a piece of a subject's soul in them when they're taken, which really brings the selfie craze into question. An old wives tale says that a bird flying into your home is a bad sign, especially if said bird circles the room and lands on the back of someone's chair and then leaves. That supposedly means the person whose chair the bird chose would die. A more specific flying death omen can be found in Mexican and Caribbean folklore: the black witch moth. The moth is bat-shaped, dark in color, nocturnal and pretty big. Female moths can have wingspans of around six and a half inches. And last but not least, there's a superstition in Argentina that claims seventh sons will turn into werewolves ... unless the president of the country adopts them. The superstition was reportedly brought to Argentina in 1907 by two Russian immigrants, where the custom held that the Tsar became the godfather to seventh sons. Cristina Fernández de Kirchner, Argentina's president from 2007 to 2015, was said to have adopted a boy as her godson because of the centuries-old superstition.